Last week, I unveiled the judges’ picks in our inaugural Reader Photo Contest; now it’s time to reveal the readers’ choice winners. 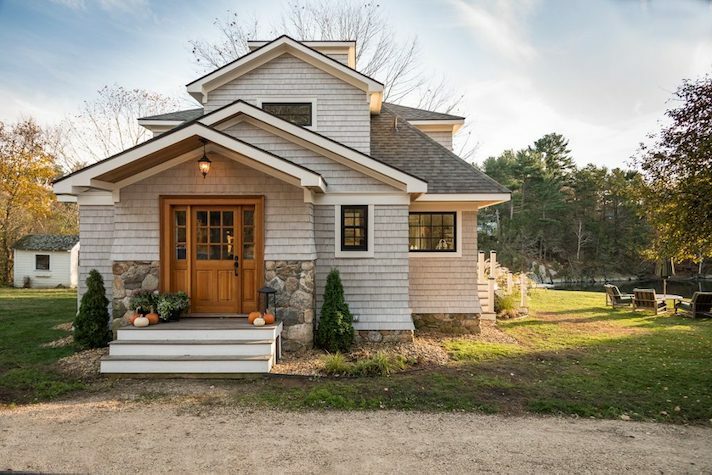 We kicked off this contest with the question, what does a dream home in Maine look like to you? And while images poured in of houses of all sizes and architectural stripes, the cottage reigned supreme. 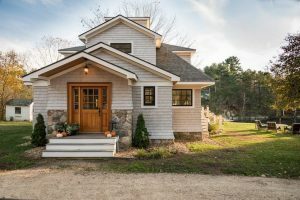 These four photos showcase a collective soft spot for finely crafted, moderately sized dwellings with classic styling and gabled rooflines. All of the winning houses also happen to be located on or near the ocean. 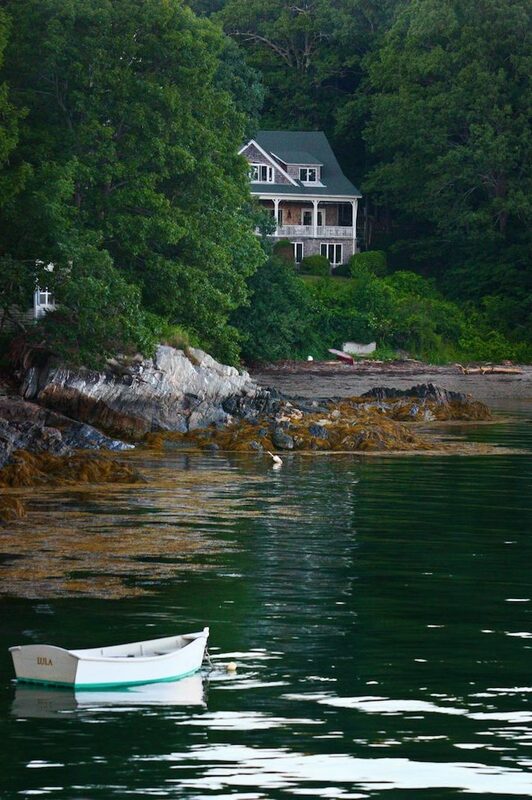 I hear you: There’s something heartbreakingly beautiful about a Maine cottage. Like you, I’m also drawn to the idea of living simply, with no more space than I absolutely need. And when I’m older, I hope to make like Miss Rumphius and “find my place by the sea.” In the meantime, I am reveling in these enchanting images, displayed here with commentary from the photographers. 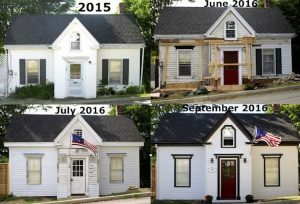 Pam Says: The 1790 Tiny House has been a labor of love since May of 2016. It is just 448 square feet and was originally home to a family of ten! 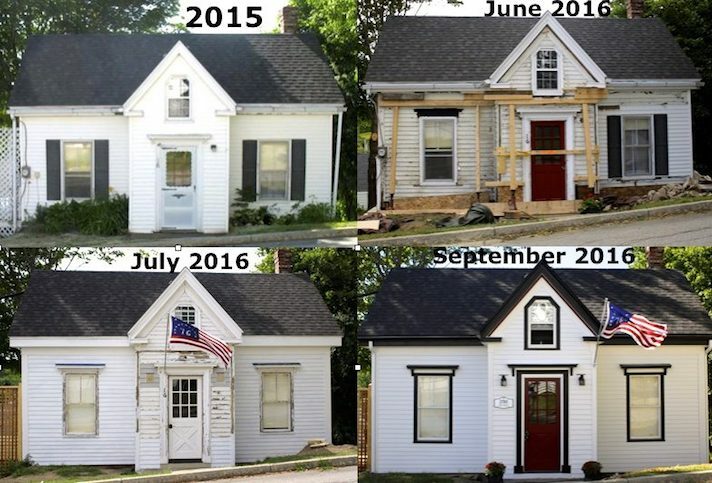 Working with a contractor, my fiancé and I replaced the front sill, removed the vinyl siding, and took her back to super-white clapboards with black trim. Inside, we have bricked the chimney, repaired and wallpapered the plaster walls, applied embossed wallpaper to the ceilings to mimic tin, and pulled up carpet to reveal wide pumpkin-pine flooring that we have left natural in some areas and painted in others. Eventually, a Franklin stove that was given to us will be painted in dark-blue enamel and put right back where one stood in the living room 227 years ago. We still have the dining room, kitchen, and bathroom to work on. We will also work on an extension of the deck to expand our view of Castle Tucker and the sunset. We welcome tours, so if the top of the Dutch door is open, don’t hesitate to knock. Anie Says: I have seen this property on Littlejohn Island in Yarmouth from the water a number of times and have always thought it was a magnificent home and blended in beautifully with the beachfront, manicured lawn, and surrounding wooded areas. As I am from the Philippines, I love being on the water and appreciate beachfront landscapes, but we do not have an abundance of this type of architecture in my home country, particularly on the waterfront. This property also has some history with my husband and his family. He summered on the island, knew the prior owner, and has been in the “cottage” on many occasions. He still has family on the island and we frequently pass this spot while boating. Sarah Says: Imagine my surprise when I saw the childhood home of one of my best friends pop up in our contest! I have had countless sleepovers, lip-sync contests, and Dirty Dancing viewings here, lounged in a hammock on that glorious front porch, sunbathed on the beach (wearing, like, SPF 4 — it was the 90s! ), played flashlight tag on the lawn, and snuck out the side door at night on an occasion or two. My friend’s mom, who married Mark and me, still lives in the 1904 home and I feel lucky that I can continue to visit. Heather Says: Ever since I was a little girl, my family would hop in the car and go on weekend outings to various locations around Maine. 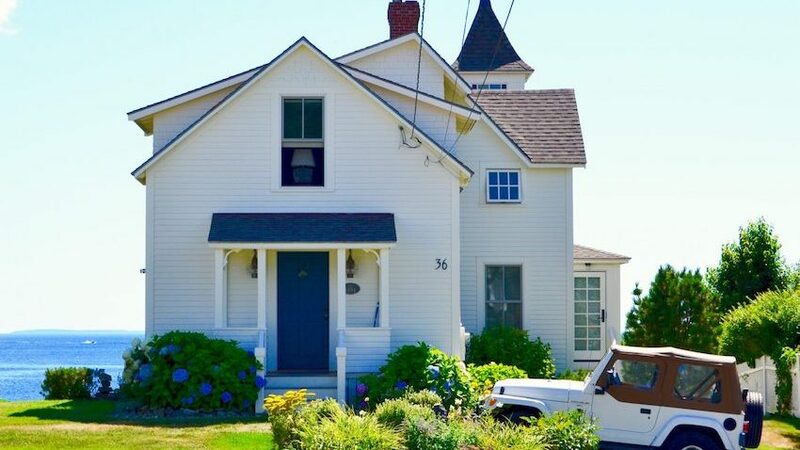 It was on one of these outings last summer that I stumbled upon this house in Boothbay Harbor. 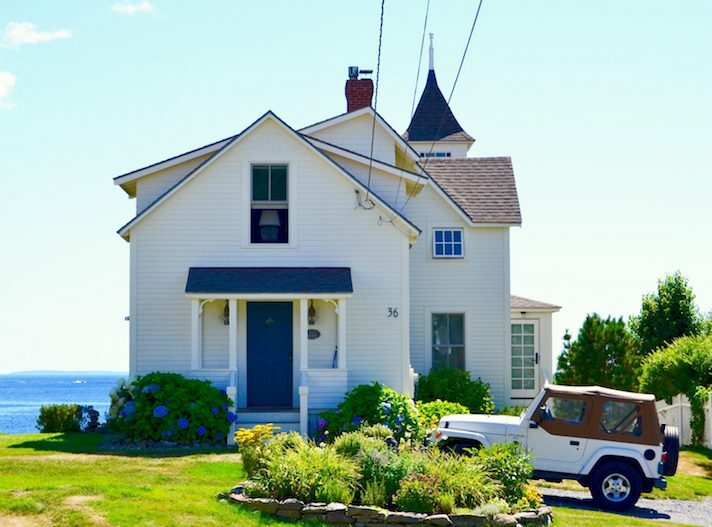 Walking along a narrow road, we turned a corner and saw the perfect coastal Maine home. The white siding against the dark water and green grass gave it an aura of proudness, like the house knew that it was beautiful. Deep-blue hydrangeas and a classic white Jeep tied the scene together. I stared at it for a while before deciding to snap the photograph, hoping that someday I would own a house as beautiful and peaceful as this one. When I entered the contest, the photo was shared on Instagram, where a woman saw it and excitedly commented that she used to spend summers in this house. As a photographer, that was a special moment, as I had the chance to invoke not only a strong sense of place, but happy emotions in another person. Tricia Says: I love this home in Kittery because it has been in my family for as long as I can remember. The original structure was a small Cape, patched and repaired many times. I designed the current, renovated structure. I wanted a small cottage that could accommodate 20 to 30 people for a party and it does! The house is only about 30 by 30 feet, but it’s all open-concept inside. My second desire was to be oil-less — everything uses electricity, including the heat and AC. This fall, we are installing 24 solar panels on the south-facing roof of the detached garage. In the summertime, we swim in the creek with our neighbors, watch the kayakers paddle by, and jump in our own kayaks. In the fall, we host a cider press day with my grandfather’s hand-cranked press and make fresh cider donuts. Wintertime is super-cozy. The back side of the house, facing south, has big windows that let in a ton of light. We head out on a nearby snowshoe trail and spark up the tiny woodstove when we get back. Life is good. 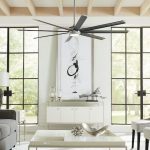 Selecting a Ceiling Fan Planning a New Home or Remodeling?